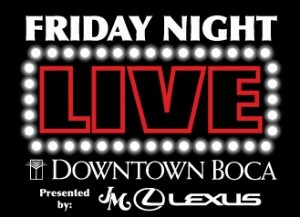 Downtown Boca invites the public to grab their cowboy boots and hats and head to its popular Friday Night LIVE! that is presented by JM Lexus on August 3rd at Sanborn Square when the downtown turns into Boca’s “CountryTown” beginning at 6:30 p.m. Headlining will be a Garth Brooks Tribute featuring the superstar’s best hits including “Friends In Low Places” to “That Summer” followed by a “Best of Country” set that will get attendees singing while stomping their favorite country line dance. To help get the new and experienced in the spirit, the free and open-to-the-public evening entertainment opens with line dance lessons as country-style culinary favorites are served up curbside by the Gourmet Truck Expo. Friday Night LIVE! festivities and streetside dining with café seating begins at 6:30 p.m. with line dance lessons followed by showtime at 7:30 p.m. Visitors are encouraged to “come early, stay late…where something for everyone awaits” as thousands have done for previous Friday Night LIVE! events that included the Panthers Patrol Red Zone Night; Chris MacDonald, the “ultimate Elvis tribute artist”; Tito Puente, Jr. and his Latin Jazz ensemble; and City Link’s Boca Beerfest. The Friday Night LIVE! 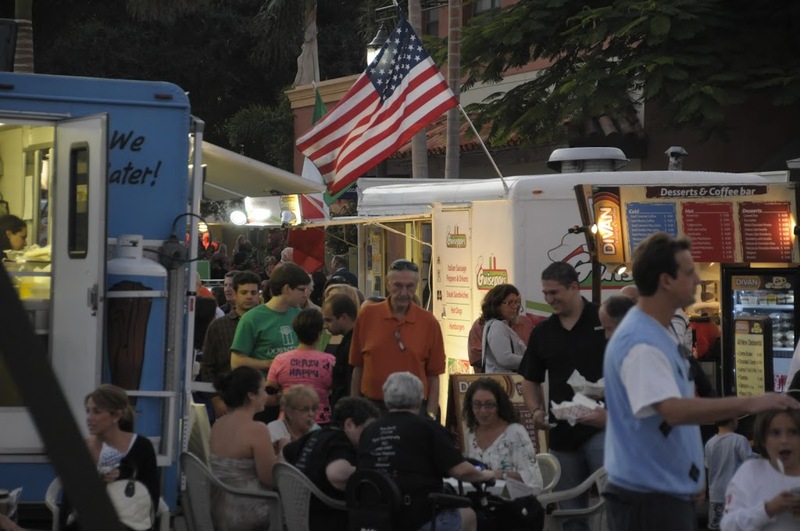 evenings include gourmet truck dining, extended hours at participating businesses with special sidewalk tastings, samplings, trunk shows, dining specials, menu items and discounts and often late night “after parties” for exploring and enjoying the destination, from Mizner Park to Royal Palm Place, including the signature collection of shops and boutiques, restaurants and galleries along Palmetto Park Road and Plaza Real South. Free parking for Friday Night LIVE! event is available at City Hall (201 West Palmetto Park Road), the Boca Raton Historical Society (71 North Federal Highway), the Downtown Library (200 Northwest Boca Raton Boulevard) and other locations downtown where event signage is featured. Held on the first Friday of every month, the Friday Night LIVE! series presented by JM Lexus fills parts of Downtown Boca (including Sanborn Square and Palmetto Park Road), showcasing live themed entertainment by award-winning bands and vocalists as participating shops, restaurants, and clubs extend their hours for “shopping and strolling” and offer Friday Night LIVE! samplings, discounts and specials. In addition, the Gourmet Truck Expo lines the event streets with themed culinary offerings and café style seating, art galleries plan exhibitions, boutiques may feature sidewalk fashion or trunk shows, and more for exploring and enjoying the destination, from Mizner Park to Royal Palm Place, including the signature collection of shops and boutiques, restaurants and galleries along Palmetto Park Road and Plaza Real South. Visitors are encouraged to bring their own blankets and chairs; chairs available for rental at $2.